Councilman John Parker II is a lifelong Indianola resident and community leader. A graduate of Indianola High School, Parker attended Iowa State University and then decided to join his family’s business, Parker Signs and Graphics in Indianola. Working as an employee since 1991 and now as the company owner for the past 11 years, Parker knows the value of owning and managing a small business in our community. As a community leader Parker served on the Indianola School Board for two terms, two years as president. 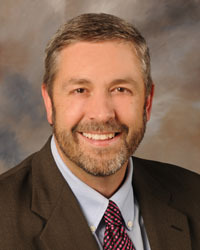 He also ran for the Iowa Legislature in 1998, has been a member of the National Balloon Classic executive board, Chamber of Commerce board member and was elected to City Council in 2011. Parker and his wife of 20 years, Heather, have three children. "As a lifelong resident of Indianola I was concerned with the lack of growth and economic development that was taking place in our community,” said Parker on his decision to run for City Council. “I wanted to see us go in a different direction to reach Indianola's untapped potential."